Commuters and Public Service Vehicle (PSV) operators have frowned on Prime Minister Mia Mottley’s decision to increase bus fares by 75 per cent, complaining that the sharp increase was simply too much, too soon. During Wednesday’s Budget speech, the PM said the government-owned Transport Board and PSV stakeholders were forced to operate under an untenable situation under a $2 fare. However in the Constitution River Terminal in Bridgetown, even conductors and drivers of PSV’s said the increase would likely do more harm than good. “I feel it is going to be a little bit hard on people because when it was raised to two dollars people couldn’t even pay you and people were coming with short money. So when it increases to 3.50, it will have a serious impact on a lot of people,” said one female conductor. She added that PSV workers, who do not own the vehicle they operate, would likely face exorbitant increases in operating costs. “I work a leased bus, so I have to wait and see what happens when that time comes, whether my lease will rise or stay the same. I don’t know what the owners will do when April comes. A lot of things will happen when that bus fare is raised. People will be calling for a lot of things,” she said. Another owner/driver chimed in: “Honestly I know it had to go up. I was saying three dollars would have been a little better for the passengers. I was even talking to some of my colleagues and saying that we could carry school children at a lower rate to help ease the pockets of the traveling public. The owner, however, admitted that the increase could provide much-needed assistance for the viability of his business. “It will help, because diesel has gone up, the cost of tires and basic things like paint have gone up so it will take some of the pressure off of you., But you still don’t want to put too much on the passengers, because these are hard economic times,” he said while adding that the service offered by PSV operators desperately needed to improve. “There are too many guys doing lawlessness on the road who are not wearing the uniform and those things need to be stamped out,” he said. Commuters, on the other hand, told Barbados TODAY that the increase was simply adding insult to injury given the tough measures already placed on the backs of the working class. Monica, a frequent commuter said the bus fare increase was simply too much. She also complained that the standard of service provided by PSV’s left a lot to be desired. 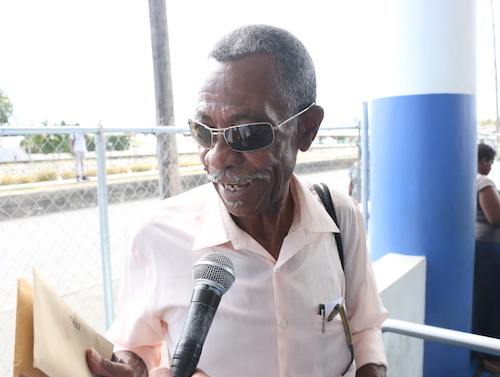 Pensioner, Lisle Walcott had a slightly different perspective on the matter. “It will become hard for people now because it is a sudden something that a lot of people weren’t expecting to happen or for it to be that high, but they will become accustomed to it and will put that amount of money aside to help them out so I don’t think that it’s all that bad,” he said. Lisle Walcott predicts the increased bus fare will be painful at first, but Barbadians would soon get used to it. Meanwhile, another pensioner who preferred to remain anonymous predicted that the measures could have a lasting impact on some commuters. “It’s not going to impact me really, because I am a pensioner, but it’s going to have an impact on families too and people who are not working that have to send the children to school. They may not have the money to do it, so it is going to have an impact on them socially and financially,” he said. Peter pay for Paul saga. Not to mention that so called bajans like to think them got wealth when they really do not. Some of this people have lumped every body into the same basket of affordability. People will now have to do serious financial management and seriously cut their spending, forget everything and everyone else. Until this bottom people send a clear message to the politicians and the 1% of little England we will stay being that financial scrape goat and downtrodden, while the people with the real wealth escapes through the net. Well said Jennifer, take a bow. Who will drive the buses, now that the brains plan to fire many of the drivers and other employees??? Mia rewarding the lawless ZR and minibus operators. They stll resisting cleaning up their act but now getting more money. BLP don’t care about poor people. So tell me JEN, what is wrong with that? Seems to be a responsible common sense financial management strategy. My take is that $3.50 is way too low for public transportation in Barbados. The fare should be $5.00 for Barbadians and legal residents only on Transport buses with a two hour transfer system. School children in uniform and seniors with ID travel free. That is the way it should be. The entitled mentality in Barbados was one of the reasons for all the slackness in the country. The reason why Barbados nearly ended up being a Banana Republic. Every one wanting something for nothing. $5.00 should have been the fare to ride on Transport Board buses not $3.50. One conductor told me last night that his boss told him he is upping the daily minimum bring in from $400 a day to $700 from April 15th. Men already got how many trips to get in to meet the target and extra. My god. This is not helping the economy. @Donild T – I do not see a problem with this people changing their spending habits. God know that is long overdue, with this continuous flippant financial propping up of the 1% of little England and nothing to show for it but material nonsense. I guess u overlooked the part of lumping everyone into the same affordability basket. The one who wearing the shoe knows it all. Maybe the big head historians and politicians should stop lick white boot and press for reparations get those lot in the UK to pay some reparations which is long overdue and stop spending what little borrowed coffers on their oppressors. $5 bus fare was way too steep for most of this people. U want to see it. Go look at their housing. Forget the remi, large flat screen TV’s etc, that is material garbage they can dump. When the robberies in full swing the ones talking will be up in the tree safe and still talking nonsense. The gov’t is not producing at the TB, so who is actually benefiting? them same politicians with the vans. Donild either you are living in a bubble or u are one unwise blp party supporter..look even if i support a party…i would say it is a bit too much and too sudden…dont let your silly party loyalty blind u…then again we dont know how your bread buttered. To start with, “stay away from CHEFETTE”. I still think the raise is phase one. Will hit $5 by 2025 as it will be bullied by the Mini Bus & ZR owners. And Parents, forget giving the Youths that $1000 cell phones. Cut back in order to be alive at the end of the haul.